LambdaVision is an ultra-high-resolution visualization and networking instrument designed to support collaboration among co-located and remote experts requiring interactive ultra-high-resolution imagery. LambdaVision investigates means to advance both science and public safety as validated by users in various disciplines of earth science research, and training exercises in disaster response and crisis management. 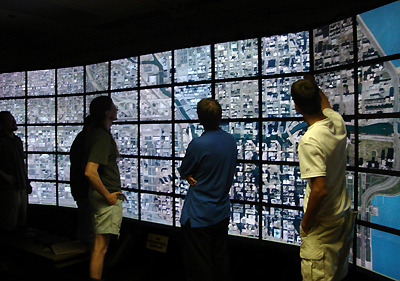 In one application, LambdaVision serves up to 60 trillion bytes (TB) of U.S. urban city map data to distributed 100-megapixel displays, enabling scientists and local, state and Federal agencies to compare real-time imagery of disasters (fire, earthquakes, hurricanes, etc.) with stored city, regional and national maps in high detail. LambdaVision is also developing adjunct wireless and camera-tracked instrumentation to facilitate interaction among users to help deploy emergency services where needed. LambdaVision entails a tenfold push of applied visualization and networking technology. The Broader Impact of LambdaVision is exemplified in the geoscience community's need for ultra high resolution display systems and viewers that can handle extremely large data sets that are stored on remote data servers. The Electronic Visualization Laboratory (EVL) at UIC actively collaborates with scientists at the US Geological Survey (USGS) Earth Resources Observation Systems (EROS) Data Center (EDC), which, responding to Homeland Security requirements, recently reprioritized its 1-meter aerial imagery gathering so as to create color imagery with 1/3 meter resolution for the 133 most-populated metropolitan areas of the United States, part of The National Map mission. The datasets are extraordinary: 365,000x365,000 pixels each, 51 Terabytes (TB) when completed. The typical visualization system available today is acceptable for low-medium ground resolution continuous representations. But decisions involving the spatial interpretation of landscape and infrastructure require high (30cm) and ultra-high (4cm) ground resolutions, dynamically adjusted to changing scale. The speed of data transfer that is required to support these high-resolution data streams can approach 10s of gigabits-per-second (Gb/s), for each of several remote collaborators. LambdaVision will develop an instrument to view this USGS data and other ultra-sized datasets. We will also design and test smaller systems suitable for use in the field, classroom, and lab. This is an example of only one of the many applications which will benefit geoscience research and education.